This morning there was a memorial ride for Peter Cram, who died last week, after getting a wheel stuck in a streetcar track at Queen and Dufferin. 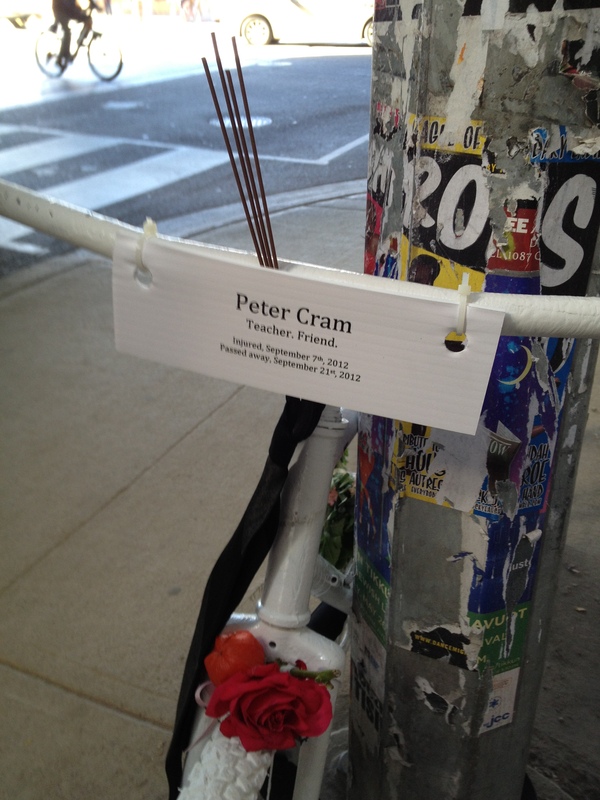 Peter Cram was the second cyclist to die in Toronto this year, under similar circumstances. Today’s Critical Mass ride, which starts at Matt Cohen Park at Bloor and Spadina at 6:30 p.m, will also pay respects to our fellow cyclist. This entry was posted on Friday, September 28th, 2012 at 12:22 pm	and tagged with critical mass, ghost bike, memorial ride, Peter Cram and posted in Uncategorized. You can follow any responses to this entry through the RSS 2.0 feed.